What is the driving force for Claisen rearrangements? I came across this mechanism (3,3 sigmatropic rearrangement). Why does the allyl vinyl ether have the ability to rearrange itself giving a new product? What drives the reaction? Is it the instability of allyl vinyl ether (if yes, state why)? The formation of the carbonyl group is a gain in thermodynamic stability over the vinyl ether. In your example, the monosubstituted alkene is a "wash". In any case, the alkyl substitution pattern of the non-enol ether double bond is not a problem. 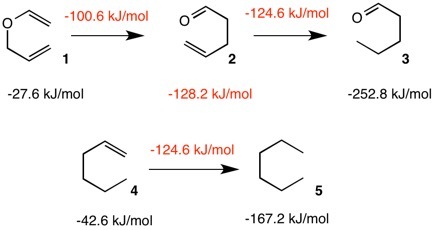 The heat of this Claisen rearrangement, first conducted by Hurd and Pollack1 in 1938, can be calculated by determining the heat of formation (ΔHfo) of allyl vinyl ether (1) and 5-hexenal (2). Heats of formation of allyl vinyl ether (1), hexanal (3), 1-hexene (4) and hexane (5) are known (NIST and Chemeo). These heats of formation are shown in black. However, the ΔHfo of 5-hexenal (2) is not accessible in tables but it can be calculated. The heat of hydrogenation of monoalkyl substituted alkenes is ~125 kJ/mol (~30 kcal/mol). The reduction of 1-hexene (4) to hexane (5) is -124.6 kJ/mol, which is computed from the respective heats of formation of 4 and 5. Applying this heat of hydrogenation to the reaction 2 ---> 3 gives a ΔHfo of -128.2 kJ/mol for 5-hexenal (2). Accordingly, the Claisen rearrangement of allyl vinyl ether (1) is exothermic by -100.6 kJ/mol. 1. C. D. Hurd and M. A. Pollack, J. Am. Chem. Soc., 1938, 60, 1905. Not the answer you're looking for? Browse other questions tagged organic-chemistry pericyclic or ask your own question. Why does rearrangement not take place in Wurtz reaction? What's the reaction type of the Hydrogen shift? What is the driving force behind sigmatropic reactions?